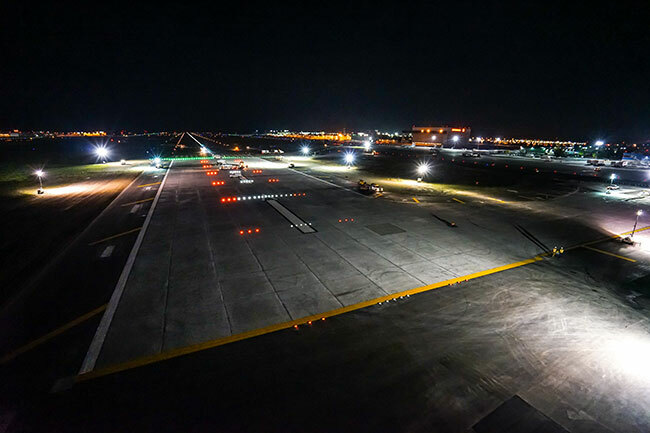 All airports have their “official” runway lengths – the asphalt or concrete measured between the runway ends, or thresholds, where landing and departing aircraft belong. But for the rare occasion where aircraft might land short (an undershoot), not stop, or not become airborne (an overrun), on the runway given to them, many runways have Runway End Safety Areas (RESA) – obstruction-free, aircraft-friendly areas beyond those official runway ends onto which aircraft can land or roll to without sustaining severe damage. Even though the International Civil Aviation Organisation (ICAO) has required RESA standards, not all airports have official RESAs. In Canada, the Canadian Aviation Regulations (CAR) recommend that Code 3 or 4 runways, (1,200 to 1,799 metres and more than 1,800 metres long, respectively) have at least a 90-metre long RESA at each end. But currently CAR does not require them. In 2011, YVR began planning the construction of RESAs for 08R/26L and 13/31 – its two South Airfield runways. Later, it began planning RESAs for 08L/26R – its parallel North Airfield runway; these runways are all Code 4. Not only would the RESAs add another layer of protection for departing and arriving aircraft, they would anticipate a required Canadian standard. “We expect a draft standard to be published this year in Canada Gazette Part I. It will then be republished [as enacted legislation] in Canada Gazette Part II in the first half of 2019. [We expect] that Canadian airports will [then] have two years to comply,” says Brett Patterson, director of engineering projects with the Vancouver Airport Authority. YVR divided the job into two parts: Phase 1 focused on building the RESAs for runways 13/31 and 08R/26L; Surrey, B.C.,-based Jacob Bros Construction was the prime contractor and YVR hired Mississauga, Ont.,-based Hatch Ltd. as design consultant. Phase 2 is the construction of RESAs for the parallel runway 08L/26R in the North Airfield. Ground will be broken for this latter Phase in March 2018. Construction on the 08R and 26L RESAs began in the spring of 2015. Contractors completed the 08R RESA that year, but the work on 26L, which included runway work and a taxiway extension for the RESA, was only completed last fall. Contractors built the RESAs for 13/31, commonly referred to as the crosswind runway, in 2016. To the innocents among us, planning a RESA would seem straightforward. Pull the required RESA length and width from a handy rulebook, calculate some load bearing requirements, stake off some acreage off the runway ends and start digging. But the engineering wheels for airport projects grind far finer than that. ICAO does have a required minimum RESA length of 90 metres and a recommended length of 240 metres. A RESA width is easy – usually twice the width of the runway. So, what is a good RESA length? It so happens that not all RESAs need to be the same length to provide the same calculated level of safety. To get there, YVR’s first decision was to work to ICAO’s RESA risk level of 0.45 in 10 million. That is, the chance of an aircraft excursion undershooting or overrunning a RESA would be about one in twenty million – one rarity multiplied by another rarity to yield an extremely unlikely event indeed. YVR then turned to the Transportation Research Board, a division of the National Research Council of the United States. It has something called the Airport Cooperative Research Program (ACRP) Report 50: Improved Models for Risk Assessment of Runway Safety Areas. An airport need “simply” feed the model with a cargo planeload of data about itself and a specific runway, and out pops a RESA length that meets the ICAO risk level of 0.45 in 10 million. “We used the ACRP 50 and incorporated aircraft data, runway slope, aircraft mix, the weather every hour for the past two years, movements, runway dimensions, etcetera to determine what length of RESAs would let us achieve the risk level of 0.45 per 10 million,” Patterson explains. The results? Five RESAs – for 08R/26L, 08L/26R and 13 – would need to be 300 metres long, and the sixth, for 31, needed only be 150 metres long, to meet the ICAO risk level. That research completed, YVR then turned to the business of just how to fit the RESAs on each runway end to minimize, for example, environmental disruption, cost and additional maintenance. The biggest challenge was on 08R, which ends just 90 metres short of a shore-side dyke. Pushing through the dyke to gain real estate (and other options) was duly considered and rejected. The planners found their 300 metres for the RESA with a combination of that 90 metres, repurposing 150 metres of runway west of the landing threshold, and shifting the 08R landing threshold 60 metres to the east. Adjustments on the 26L end allowed the planners to retain the old runway takeoff and landing length. The most difficult construction work scheduling was for the 08R/26L RESAs. During the day YVR needs both parallel runways, so 08R/26L could only be closed at night. The airport gave the prime contractor, Jacob Bros. Construction and its subcontractors, just eight hours a night to pass through security and onto the airfield, convey its equipment and workers (as many as 200 on some nights) to several work sites, work, return the work sites to safe and debris-free operating condition, and then leave the airfield. “Getting through security takes out an hour at each end. You have about six hours to work. We understand the importance of keeping the airport operating 24/7 and we take pride in being one of the few local contractors with the expertise to perform complex airside paving work under tight deadlines,” says Scott Jacob, principal at Jacob Bros.
“It is a lot of collaboration and communication between different parties. Air traffic control and Nav Canada, the Jacob Bros.’ team, the subs – all brought together by someone from the engineering team. It is a marvel to watch,” Patterson adds. While the RESAs themselves required excavating thousands of cubic metres of wet delta sand, and trucking in tens of thousands of tons of sand sub-base, crushed gravel, concrete and asphalt to build them, many other tasks also occupied the contractors: drainage pipes and manholes, kilometres-worth of electrical ducts, hundreds of lights, pavement marking and seeding, removal and reinstallation of some of the approach lighting. And since the instrument landing systems required adjusting after moving the thresholds, Nav Canada flight checked them and the airlines updated their planes’ approach plates.